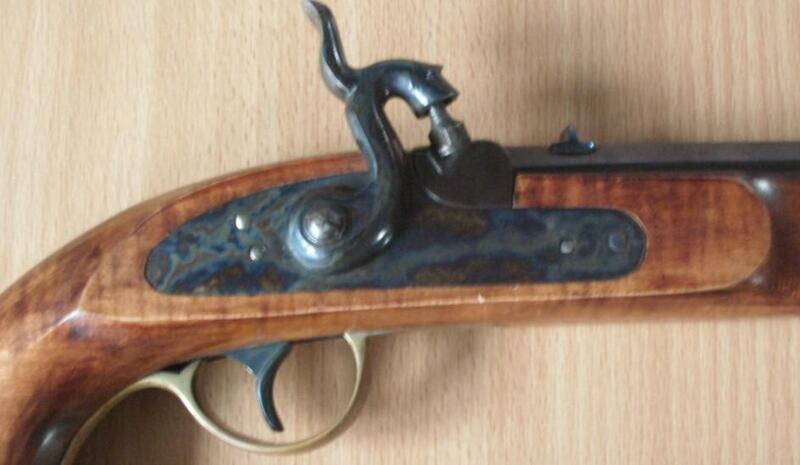 Copy of Liège of a flintlock pistol HARPER FERRY model 1805-1808. ELG on star in a vertical oval: final acceptance, of use of 1846 to 1893. 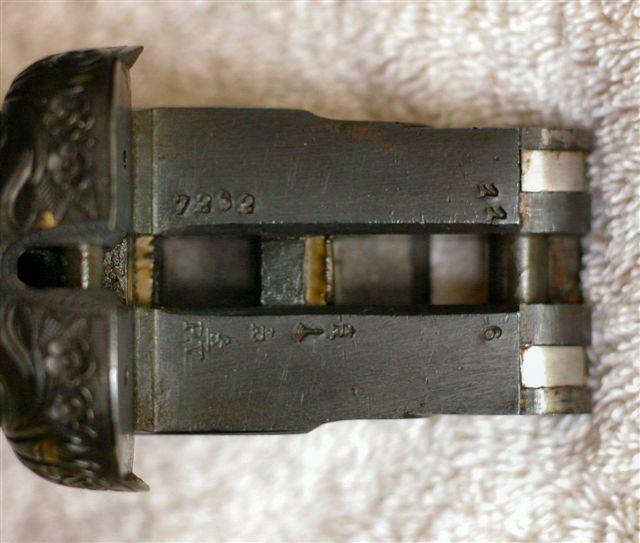 These punches thus reveal a period of manufacture going from 1853 to 1893. 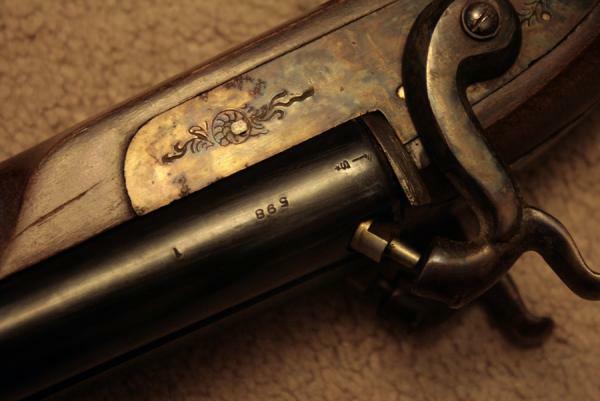 The barrel is marked F.A.U.L meaning “Fabriques d’armes unies de Liège” whose seat was in Liege, 22 street Trappé. 14, 4: is the gauge corresponding to gauge 28. 17: it should be a question with my direction of a serial number. /VII: they are markings of “équipors” meaning: /=10 V= 5 - II = 2 is on the whole 17 like above. Publicity of the firm: see appendix 1. 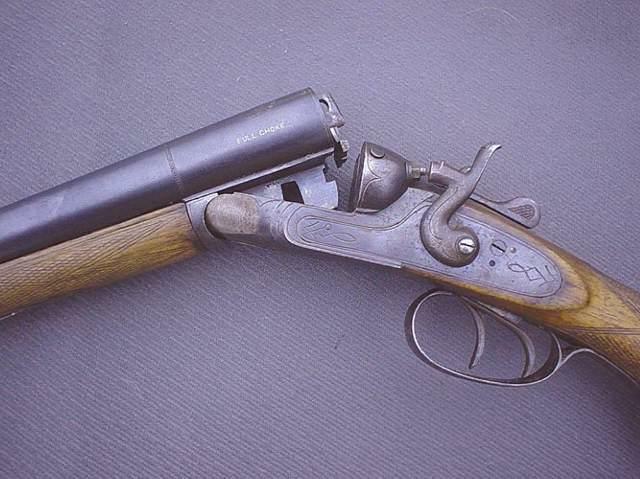 Very beautiful counterpart (functional and subjected to authorization) of a pistol with percussion to be charged by the mouth (gauges unknown). Letter “S” spangled: countermark of the controller post 27/01/1877. The S spangled refers to Daenen Charles, controller active of 1952 to 1980 - to see appendix. ELG on star in an oval: final acceptance post 11/07/1893. 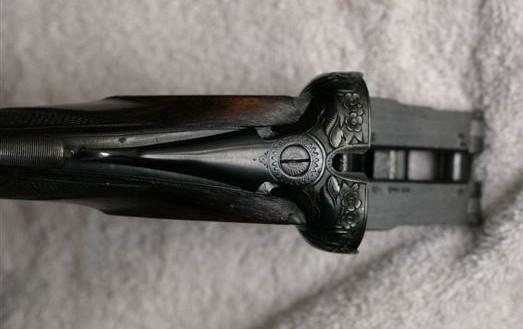 For information the ELG on star in an oval NOT CROWN (which could make believe that this weapon is former to 1893) is the exception for the weapons to charge by the mouth (blasting powder) and is always valid for this type of weapon. 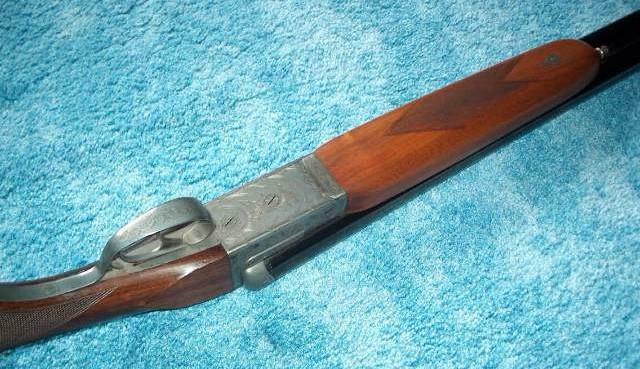 Double shotgun to percussion and loading by the mouth of modern manufacture (2nd half of the XXe century) produced until 1976 by the firm CENTAURE (Fabrique d’armes unies de Liège) street Trappé, 22. The steel unrifled bores are juxtaposed, they are maintained with keys. The rocker is with ahead embedded locks. 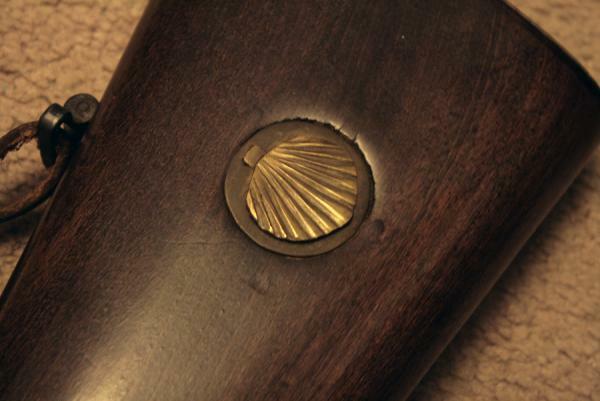 The stick in walnut is worked “with English”, it comprises a “capsulière” cockles. ELG on star in a vertical oval: acceptance, guns to be charged by the mouth, of use from July 11, 1893 at our days. EL in English letters: provisional test, of use from December 21, 1852 at our days. 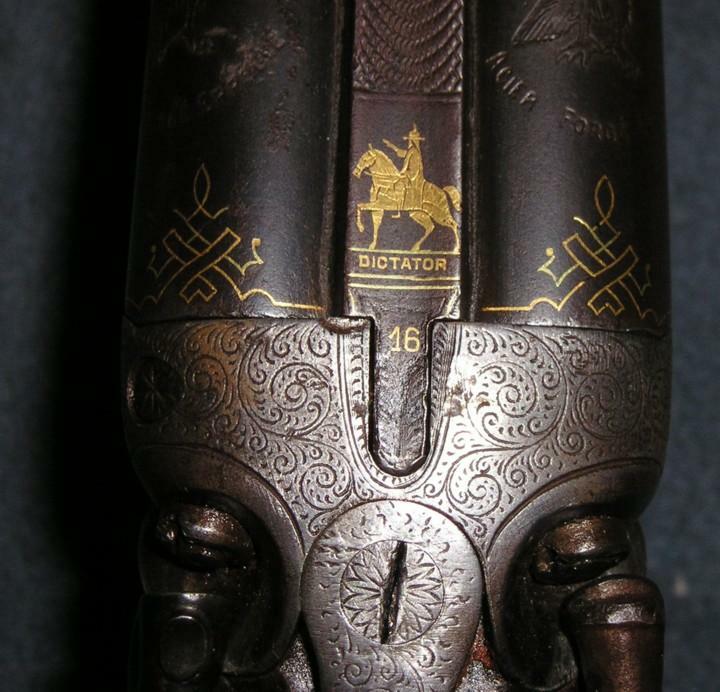 S spangled: countermark of the controller post 1877. 16.2: gauge in mm (corresponding + - to gauge 20). In use of 1889 to our days. 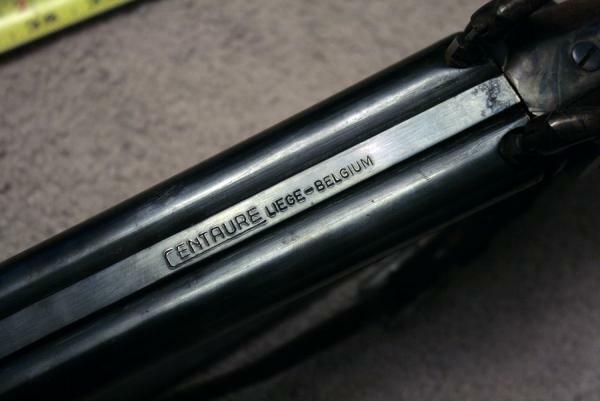 CENTAURE LIEGE BELGIUM: mark deposited by the “Fabrique d’armes unies de Liège” from LIEGE street Trappé, 22, registered with the proofhouse of Liege since 1920. 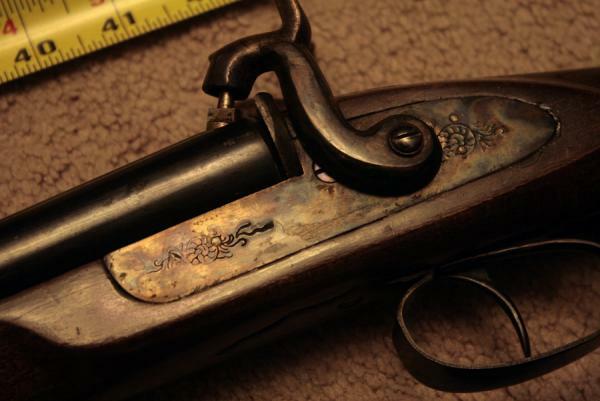 It manufactured counterparts of old weapons until 1976 and the sale continued until 1992. 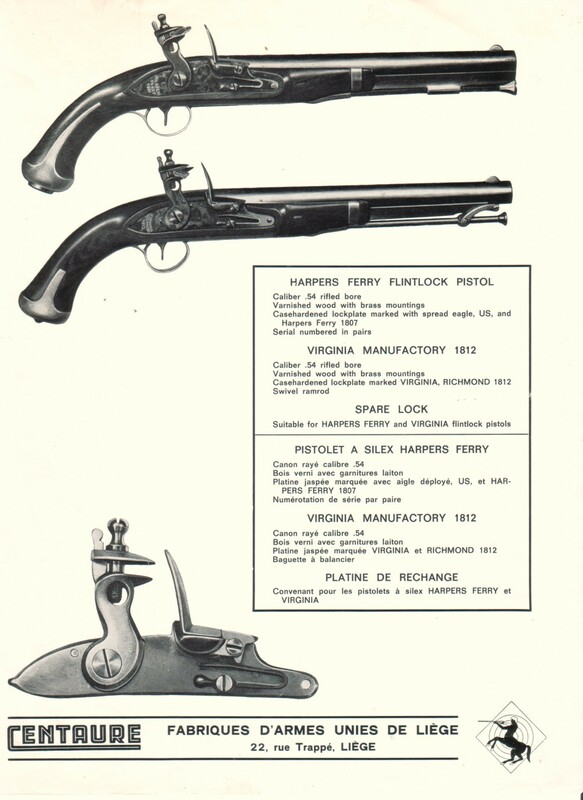 Appendix: a page of a catalogue CENTAURE showing a weapon in the same style. La platine à percussion centrale est à chien extérieurs et la clé entre ces chiens « top lever ». Les canons en acier éprouvés sont frappés d’un aigle aux ailes déployées mais que je n’ai pu identifier avec certitude car il n’est pas visible complètement. 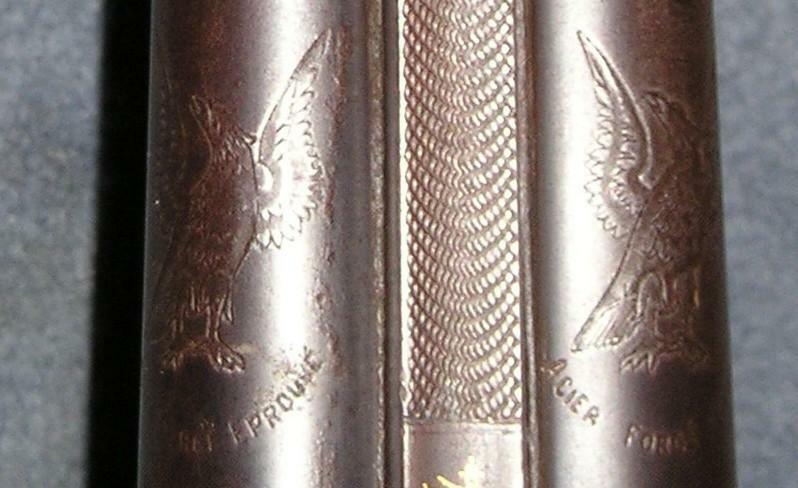 Or plusieurs fabricants de canons de fusils comme CAP Joseph et LOCHET Arnold ont utilisés ce logo avec de petites variantes. 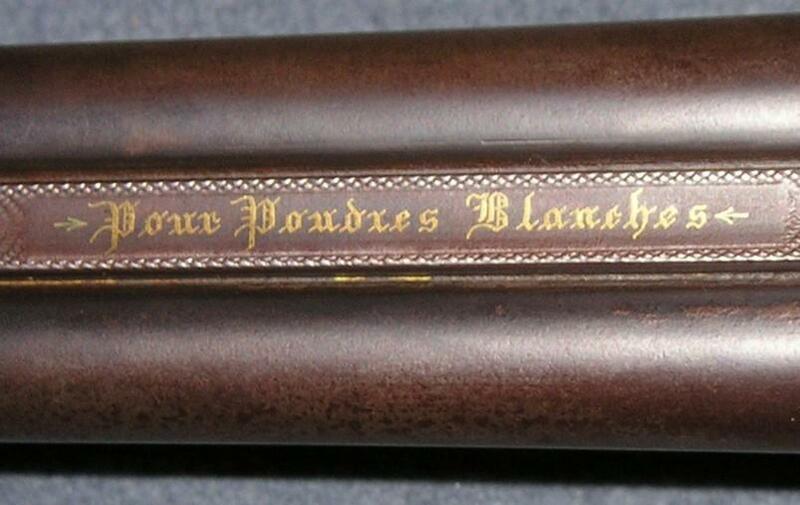 La bande reliant le canon porte en or incrusté la mention "Pour poudre blanche" ce qui indique bien sur que l’arme est éprouvée à la poudre sans fumée par opposition à la poudre noire. La crosse à l’anglaise est en noyer et la longuesse à poussoir. La platine porte une gravure florale à l’anglaise également. ELG étoilé dans un ovale couronné : acceptation post 1893. S et T étoilés : contremarques des contrôleurs post 1877. 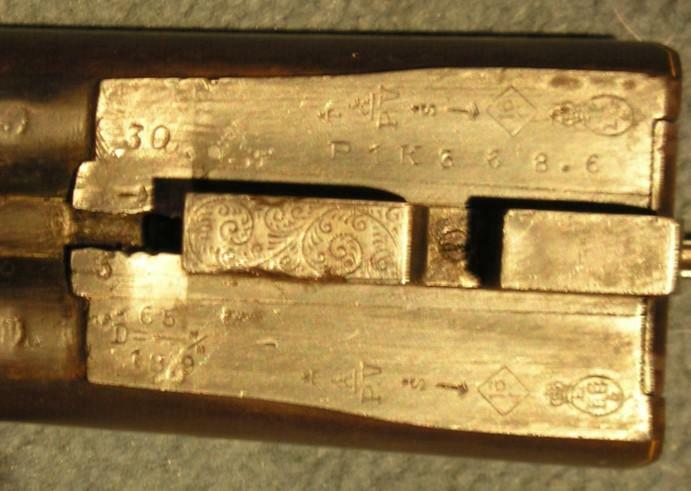 16 C dans un losange : calibre, en usage de 1898 à 1924. 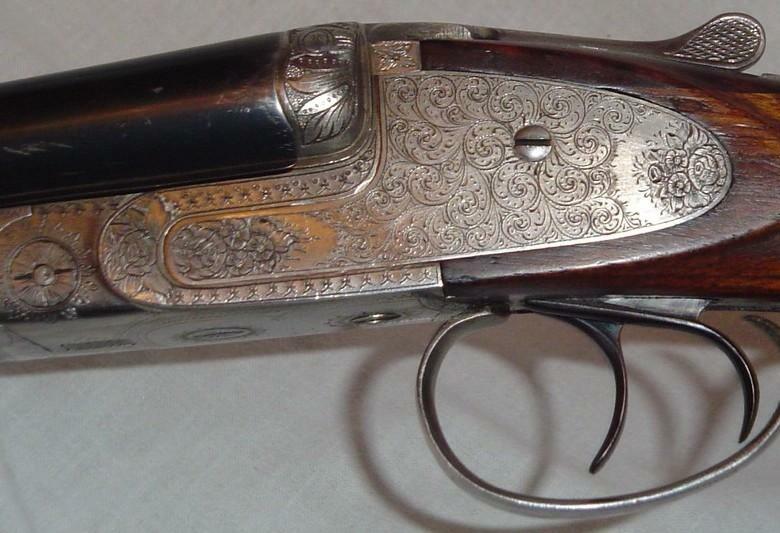 P1K668.6 : poids du canon pouvant tirer des poudres sans fumée (armes lisses) En usage de 1892 à 1924. D = 65/18.9 m/m : longueur de la chambre en mm et diamètre en mm après épreuve facultative à la poudre sans fumée. En usage de 1892 à 1924. 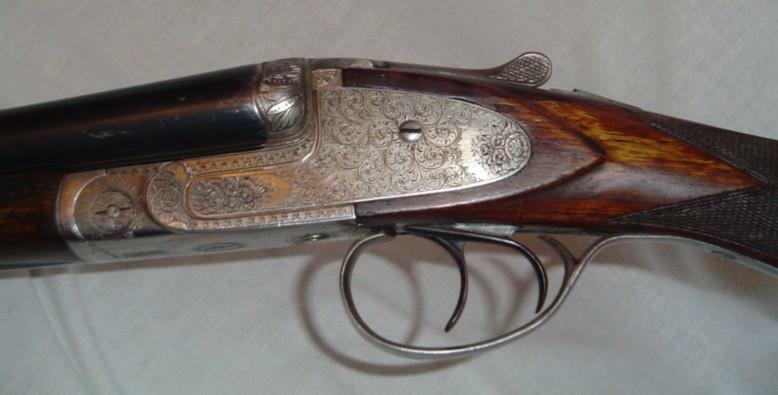 L’arme aurait donc été fabriquée entre 1898 et 1924. 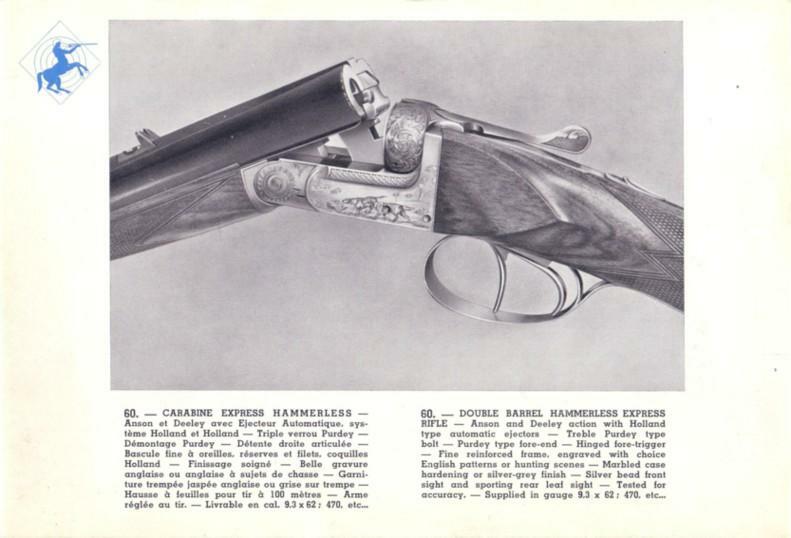 Formed originally in 1919 by amalgamation of 3 large Liège arms manufacturers, Fabriques d'Armes réunies, Fabrique d'Armes de Liège, and Ferdinand Hanquet. 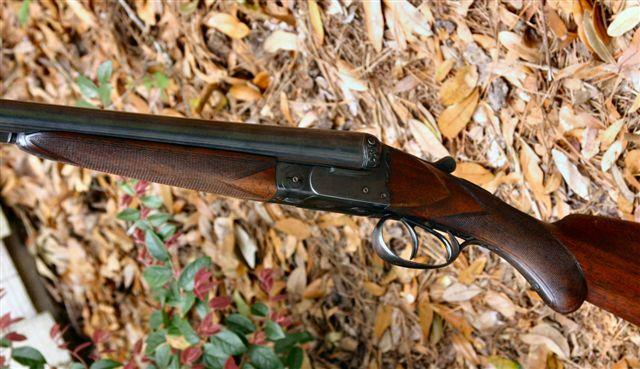 A major product was the 'Hammerless' rifle. 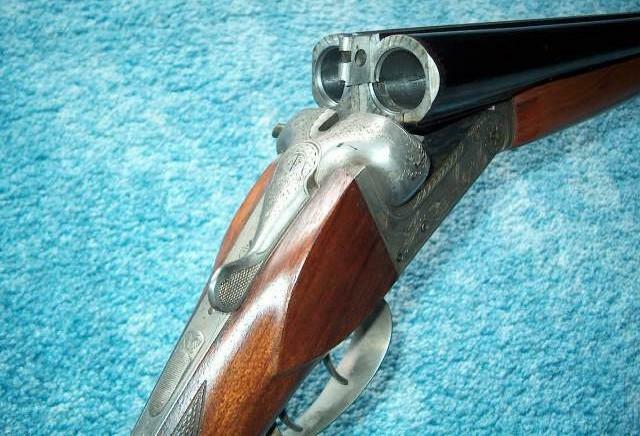 Shotgun to unrifled bores and juxtaposed gauges 12 of them, it lock is of hammerless type to key top lever and the stock of pistol type. Small d underlined: letter annal 1968. I am not differently explained these two yearly letters than by a replacement of barrel or a visit with the late test?? 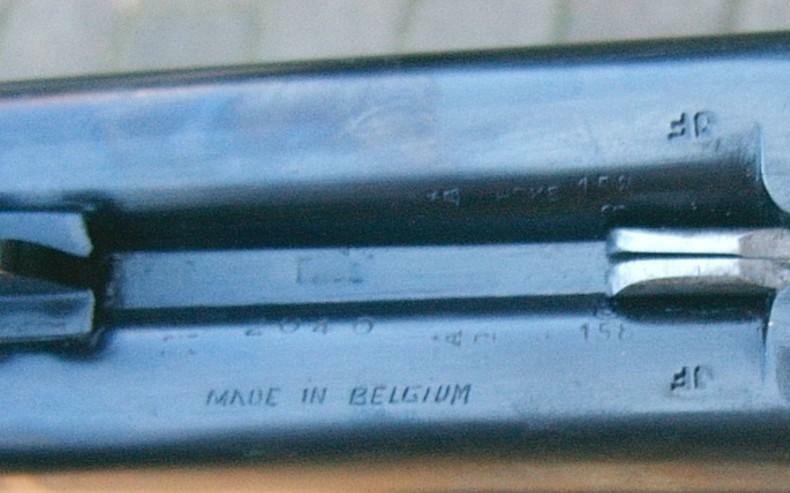 F.A.U.L: mark of Fabriques d’Armes Unies à Liège street Trappé, 22 in Liege. JF marks of Jean FALLA street New Bonne 35 in Liege, manufacturer of barrels (see site). Made in Belgium: no comment. Fabrique d’Armes Unies de Liège SA. 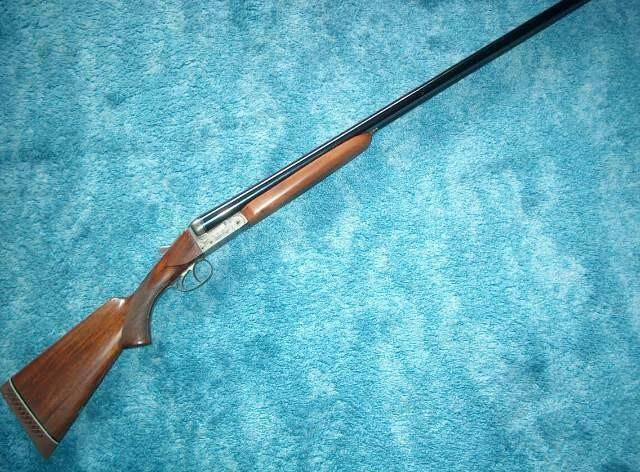 Shotgun to juxtaposed unrifled bores gauges of it 12, lock hammerless, top key and “longuess” with push-button. Spangled ELG in a crowned oval: acceptance, of use of 1893 to 1968. Peron: inspection, of use of 1853 until todays. R spangled: countermark of the controller, of use of 1877 to 1968. 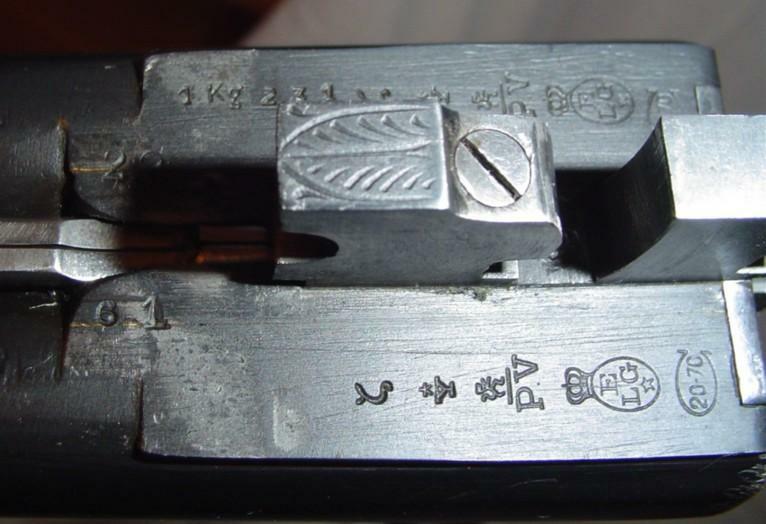 PV surmounted of a stylized lion: test with the powder without smoke, of use of 1898 to 1968. FC or AV spangled: countermark of the controller, of use of 1877 to 1968. 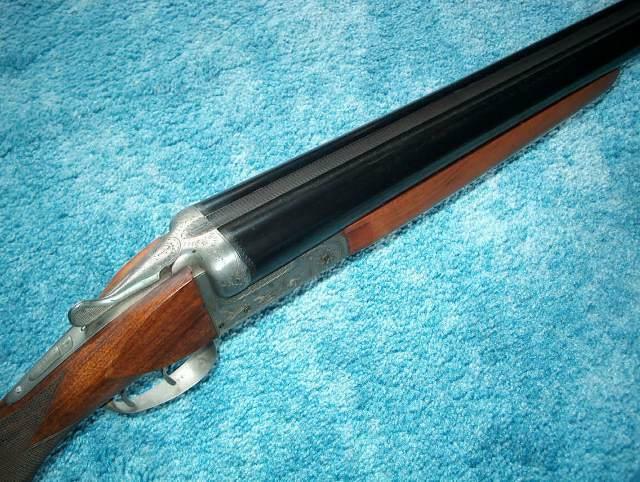 12-70 inside large C: gauge nominal and length of the casing, of use of 1924 until todays. 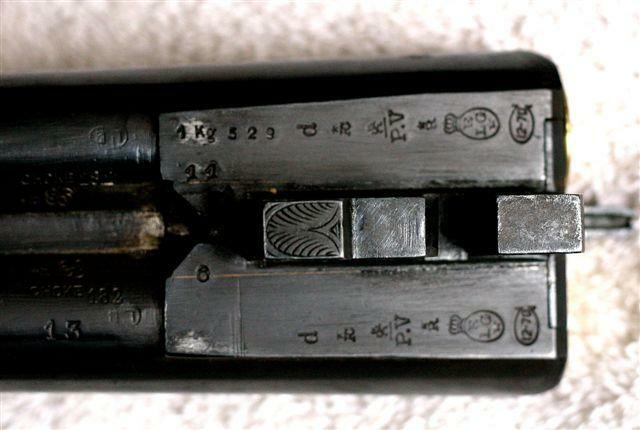 1Kg 529: weight of the gun which can draw from the powders without smoke (weapons smooth) except for the gram. In use of 1924 until todays. 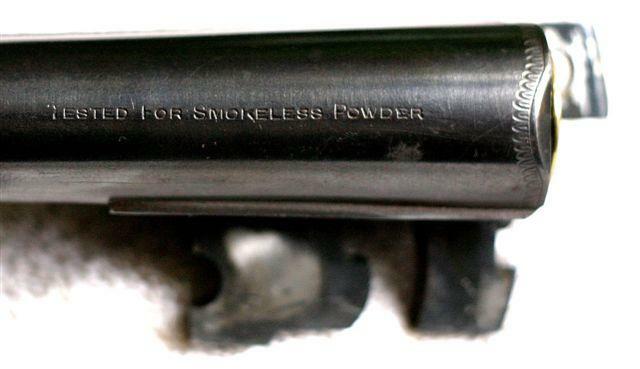 TESTED FOR SMOKELESS POWDER: without comment. 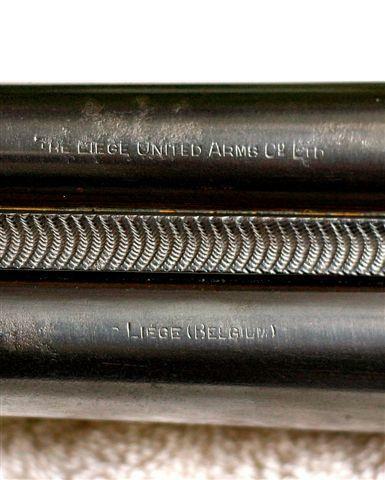 THE LIEGE UNITED ARMS C° LTD: Mark of the "Fabrique d’Armes Unies de Liège SA" street Trappé, 22 in Liege. Mark deposited the 01.06.1923. 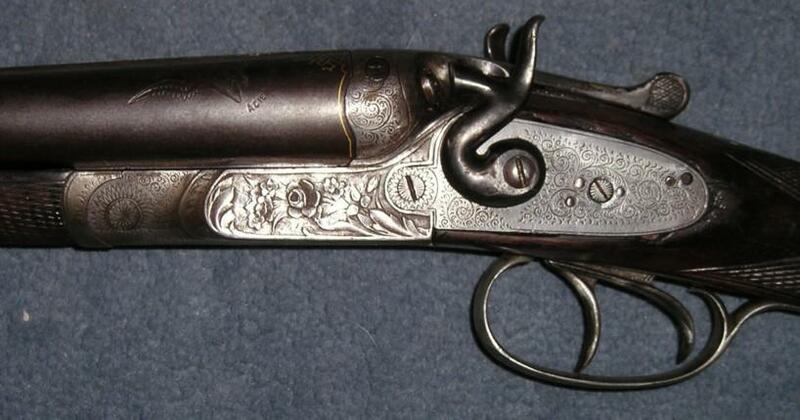 It acts of a weapon of hunting hammerless, gauges 12, with two juxtaposed guns and key Top Lever. 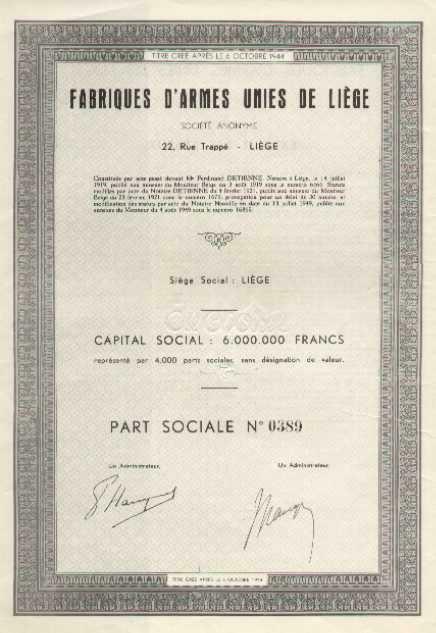 THE LIEGE UNITED ARMS C° Ltd Liege Belgium: it acts of a trade mark the 01.06.1923 by the Fabrique d’armes unies de Liège (F.A.U.L.) street Trappé, 22 in Liege. 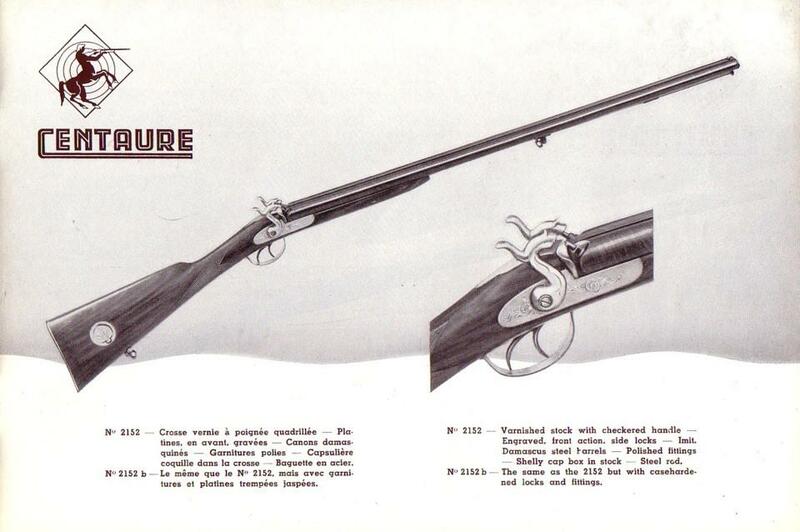 D crowned should be the mark of the manufacturer of guns DELCOUR-DUPONT Jean, trade mark the 06.06.1921. 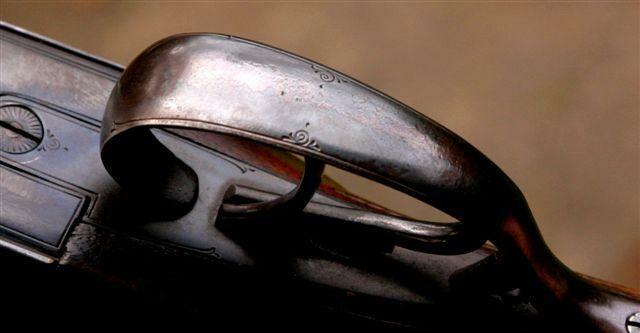 The passage the all weapon proof made in Belgium is obligatory since the imperial decree of 1810. ELG in a crowned oval: acceptance, punch used of the 11.07.1893 with before the 26.02.1968. PV surmounted of a stylized lion: test with the powder without smoke, punch used of the 04.10.1898 with before the 26.02.1968. 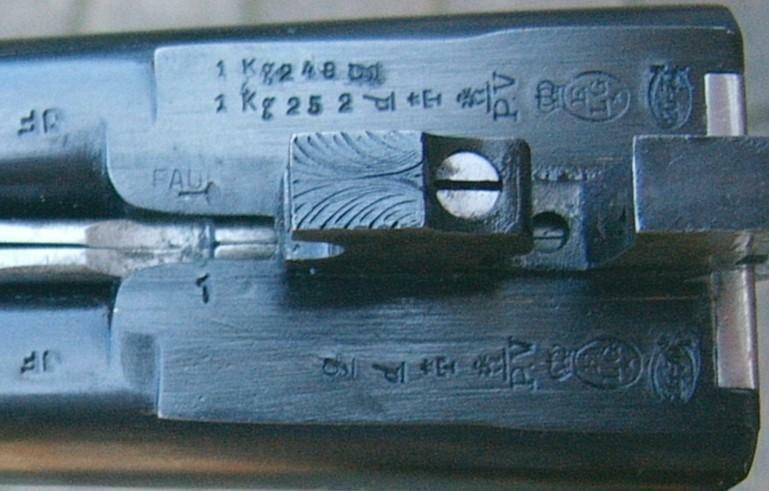 1Kg 527: weight of the gun which can draw from the powders without smoke (weapons smooth) except for the gram, punch used 30.06.1924 until today. 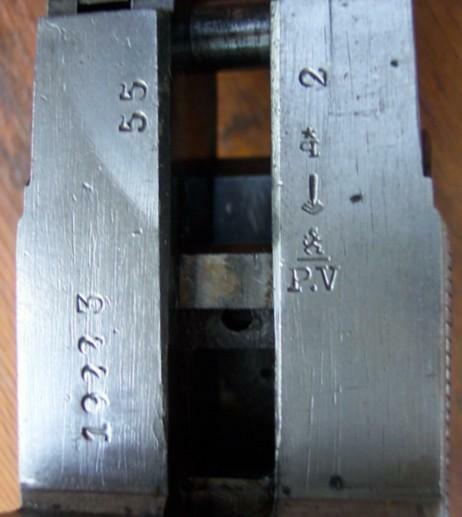 Perron (little tower): inspection - punch used of the 16.06.1853 until today. 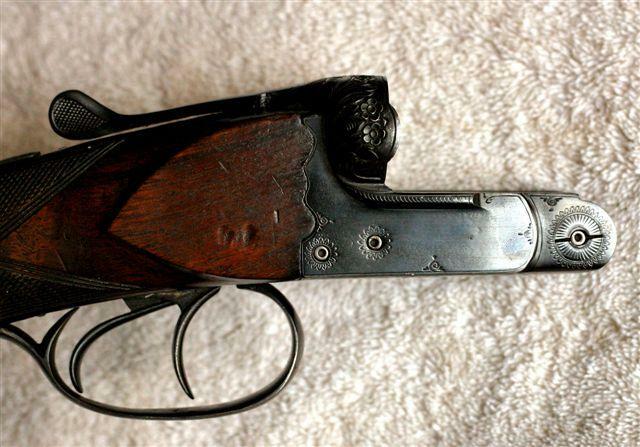 12.70 inside large C: (with reserve because I am not on to have well read the photograph) it acts the nominal gauge of the weapon and the length of the casing. 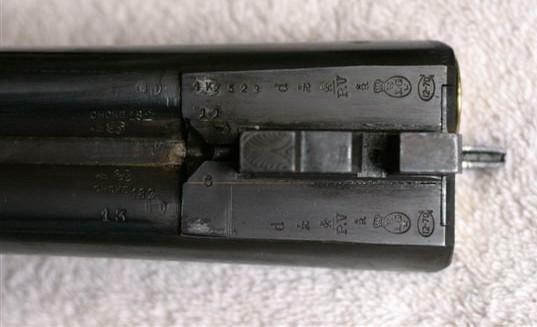 Punch used of the 30.06.1924 until today. 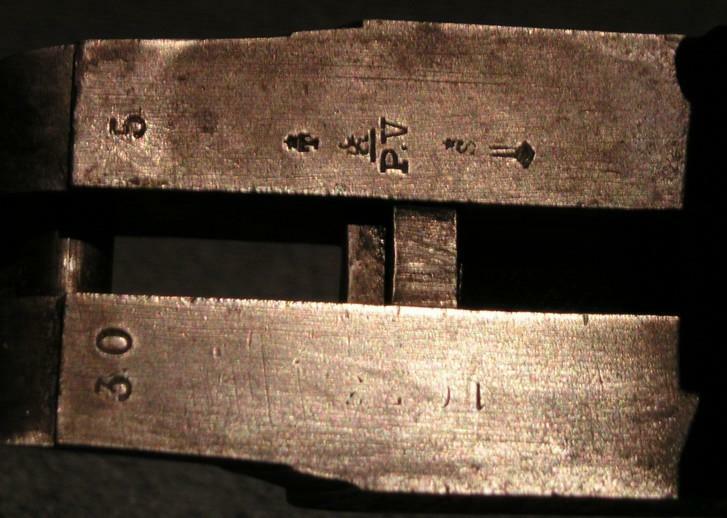 L and C spangled: countermarks of the controllers, punches used of the 27.01.1877 with before the 26.02.1968. CHOKE 18.2: “chokes” barrels: cal. 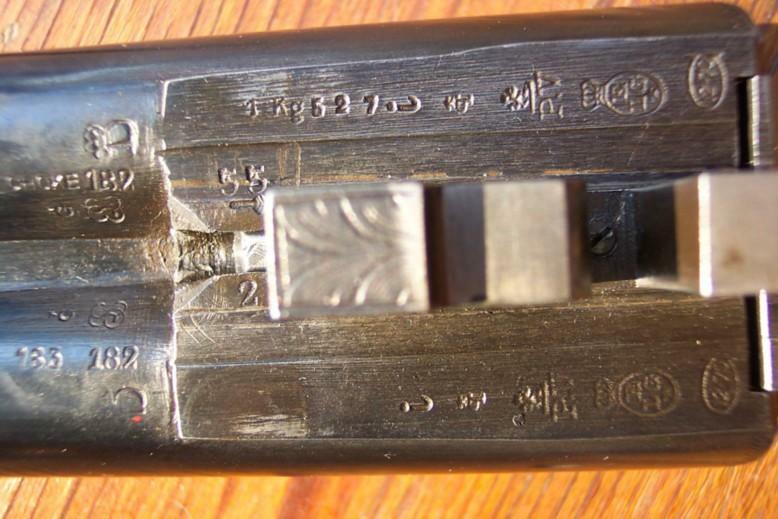 to 22 cm of the cylinder head, punch used of the 30.06.1924 with before the 26.02.1968. 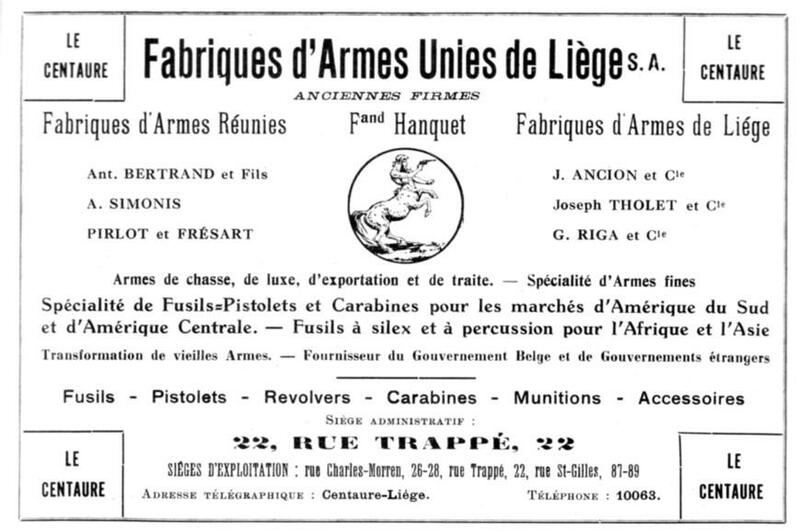 This mark belongs to the firm " FABRIQUE D'ARMES UNIES DE LIEGE S.A." street Trappé 22 in Liege - founded 01.06.1923. 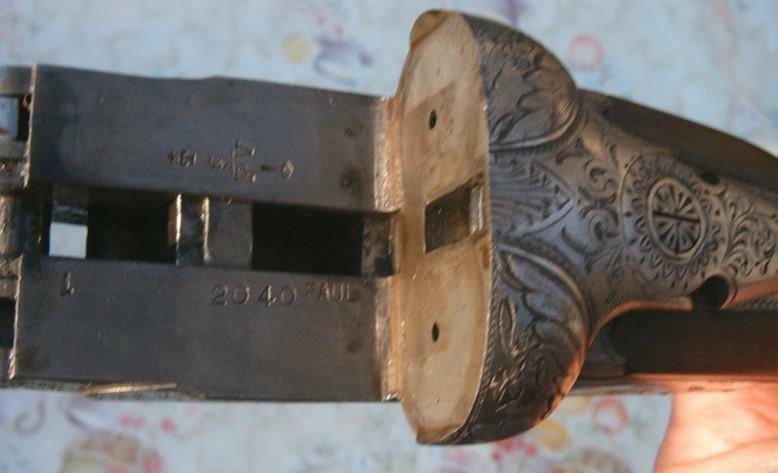 It acts of a shotgun gauge 16, with barrels juxtaposed, hammerless, key of opening on the top, triples bolt, pistol grip.